PackagingKnowledge article with details and specifications on all types of printed carrier bags. Interesting "best of the web" directory with links to useful carrier bags websites. When German scientist, Hans von Pechmann, found a waxy residue at the bottom of his test tube he had no idea that the substance was an early form of what it is now used to produce plastic carriers, shopping bags, wrapping film and many other types of plastic packaging. He had, completely by accident, made polythene, one of the world's most widely used and controversial materials! The campaign designed to remind people to reuse carrier bags rather than take new ones from the checkout is giving good results. CBC spokesman Peter Woodall said around 80% of people already reuse their carrier bags and that he hoped the campaign would "help convince the remaining 20%". Merry Widows wines available in a 250ml, 500ml and 750ml bottles is available in the UK since June. The carrier is made and printed by a company in London, from a single piece of folded 350gsm Frovi Carry board. It sits over the shoulders of two 250ml wine bottles and enables consumers to put their fingers between the bottles to grip them securely. It does not obscure the bottle labels, removing the need to duplicate information on outer packaging. 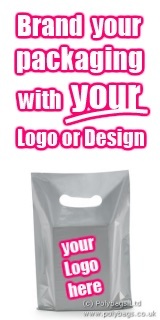 Printed carrier bags are an ideal way to generate exposure around an event or to build brand loyalty among staff and customers.